This day and age is not an easy one to live in. Yes, you have access to more information than ever before. You can travel to most of the world at a moment’s notice. There is so much technology out there to make your life easier. But, along with all the advances and efficiencies comes more stress. The only reason you need so much technology is because it seems there’s so much more to do. Life is more complicated. It seems you have to keep working and working just to make enough money to survive. Sometimes, you think how nice it would be to just have a farm and a small home and just grow all your own food. So you don’t have to worry about everything else. But, you don’t want to move to a farm. Really, you just want a good night’s sleep. And, with all the stress, you rarely get one. You stay up in bed, staring at the ceiling and thinking. You toss and turn looking for that ‘sweet spot’ that will help you drift off to dream land. And you just can’t find it. Eventually, your body does give in and fall asleep but only for a couple hours. Then, the next day starts. This is the story for many Americans. In fact, there are over 60 million sleep-deprived Americans. And when you don’t get enough sleep, you won’t be as efficient. So, you’ll be getting less done with the hours you’re awake, leading to more stress and pressure. It’s a vicious cycle. Sleep is becoming more and more important – if it wasn’t important enough already. Thankfully, there is a natural sleep supplement you can take to help you with your tossing and turning. SLEEPSolve 24/7 contains four natural, non-addictive ingredients. It contains Seditol (a combination of botanical extracts), Melatonin, 5-HTP (from a seed extract), and Magnesium Glycinate (a natural relaxing agent). Together, they calm your mind, relax your muscles, and support healthy sleep. In other words, SLEEPSolve 24/7 will help you fall asleep quickly by slowing down your mind and allowing you to relax. It helps you be free from the stressful thoughts of your days so you can enjoy your nights. And, even better, you’ll wake up feeling refreshed and restored for the first time in who knows how long. That way, you can also have a chance at enjoying your days and being your old productive self. And, the best part of SLEEPSolve 24/7 natural sleep supplements is that, well – they’re natural. That means no side effects. So don’t wait any longer. Sleep is one of the most important aspects to both short-term and long-term health. Your body needs enough sleep so it can heal, restore, and stay in shape. 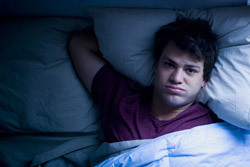 Over time, lack of sleep can start to affect you more and more. And, don’t think you’re getting more done by skipping sleep. That’s just an illusion. Over the long run, you’ll get more done in less time when you’re well rested. So get that good rest with the help of natural sleep supplements and start a new restful habit.